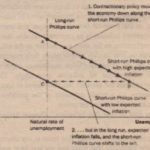 As we have seen, when Paul Volcker faced the prospect of reducing inflation room Its peak of about I percent, the economics profession offered two conflicting predictions. One group of economists offered estimates of the sacrifice ratio and concluded that reducing inflation would have great cost in terms . 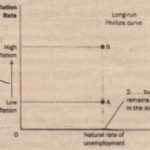 output and high unemployment Another group offered the theory of rational expectations and concluded that reducing inflation could be much less costly and, perhaps, could even have no cost at all. Who was right? 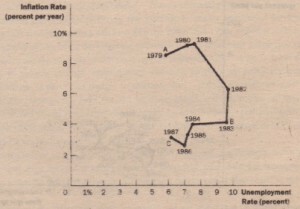 Figure 11 shows inflation and unemployment from 1979 to 1987_As you can see, Volcker did succeed at reducing inflation. Inflation came down from .almost 10 percent in 198 i and 1982 to about ~ percent in 1983 and 1984. Credit for this reduction in inflation goes completely to monetary policy. Fiscal policy at this time was acting in the opposite direction: The increases in the budget deficit dung the Reagan administration were expanding aggregate demand, which tends to raise inflation. The fall in inflation from 1981 to 1984 is attributable to the tough anti-inflation policies of Fed Chairman Paul Volcker. The figure shows that the Volcker disinflation did come at the cost of high unemployment. In 1982 and 1983, the unemployment rate was about 10 percent-about 4 percentage points above Its level when Paul Volcker was appointed Fed chairman. At the same tune, the production of goods and services as measured by real GDP was well below its trend level. The Volcker disinflation produced the deepest recession in the United States since the Great Depression of the 1930s. This figure shows annual data from 1979 to 1987 on the unemployment rate and on the inflation rate (as measured by the GDP deflector). The reduction in inflation during this period crane at the cost of very high unemployment in 1982 and 1983. Note that the points labeled A. B. and Chin this figure correspond roughly to the points in Figure 10. Does this experience refute the possibility of cost less disillusionment suggested by the rational expectations theorists? Some economists have argued that the answer to this question is a resounding yes. Indeed, the pattern of disinflation shown in Figure 11 is similar to the pattern predicted in Figure 10. 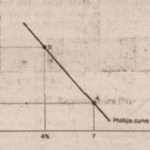 To make the transition from high inflation (point A in both figures) to low inflation (point C), the economy had to experience a painful period of high unemployment (point B). Yet there are two reasons not to reject the conclusions of the rational-expectations theorists so quickly. First, even though the Volcker disinflation did impose a cost of temporarily high unemployment, the cost was not as large as many economists had predicted. Most estimates of the sacrifice ratio based on the Volcker disinflation are smaller than estimates that had been obtained from previous data. Perhaps Volcker’s tough stand on inflation did have some direct effect on expectations, as the national-expectations theorists claimed. inflation. Thus, the Volcker disinflation does not necessarily refute the rational expectations view that credible disinflation can be cost less. It does show, however, that policymakers cannot count on people immediately believing them when they announce a policy of disinflation.